Just now reading this @wsj piece on YA books. Awful. http://t.co/w485J0I Glad @neilhimself has joined the rebuttal. What? I wonder. WSJ is the Wall St Journal (in which I've read a bunch of interesting articles before). @neilhimself is the Twitter username of author Neil Gaiman, who you might remember weighed in on the side of the angels in the recent interrogations of teacher librarians in Los Angeles. If he's rebutting this article... and there's a link to follow, so I follow it. It didn't take long for this discussion to take off on Twitter, and the hashtag which emerged to tag tweets about this was #YAsaves. If you're a teacher librarian reading this (or a librarian), then you'll know what a subject heading is. If you're a library user, you've used them. On Twitter, hashtags help you follow conversations and discussions and topics. Some examples: #austl for tweets of interest to Australian teacher librarians; #YAlit for young adult literature; #tlchat for teacher librarian topics generally, and also scheduled teacher librarian chat sessions on Twitter. And so on. Anyone can invent a hashtag, and sometimes people use them for fun (#sorightnowihavehadenuf). follow #YAsaves for some amazing stories about how books change kids' lives, in response to a negative @wsj article about teen fiction. There's the hashtag, to facilitate the discussion. @YAsaves. The tweets started coming thick and fast (and while every tweet tagged with #YAsaves would be findable with that tag, remember that all I get in my Twitter stream are tweets from people I follow and tweets they have retweeted, which are signified by RT or via). Guess what? #YAsaves is now the third highest trending topic in the US. That took all of about 20 minutes. Get it, @wsj? Book banners? That tweet was twelve minutes after the very first tweet I quoted at the start of this blog entry. Shows how fast the impact of a topic can be on Twitter, and also how many people are passionate about young adult literature. You guys on #YAsaves are all so awesome. Seriously, I can't imagine a better bunch of people to work for. #yasaves is trending world wide. @libbabray; @maureenjohnson started something incredible @wsj claims 2 be listening. Wow. This opinion made me chuckle. I know kids who'd agree! The discussion goes on: I had lots of other things to do yesterday, so was only dipping into Twitter from time to time. If you go to look at the #YAsaves discussion on Twitter, be aware that the downside of a trending (popular) topic is that the bots and spammers and rubbishfolk get onto it. If some of the tweets listed under this hashtag look like gobbledegook, ignore them - they are rubbish - and scroll down through the list to the relevant ones. I'm sure this discussion isn't over. It will flow on into blog entries (for example, like the one you're reading now, and I'm sure many many more) and other commentary. The tweets I've used here were written over less than two hours, and demonstrate the dynamic and exciting possibilities of microblogging (140 characters max per tweet? Plenty!) and its immediacy. I didn't contribute to the discussion (then: guess I am now! 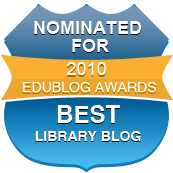 ), just watched and read and followed links and considered the issues, all relevant and important to teacher librarians. RT @melissa_marr: RT @lbschool: "And here is an awesome response to the @WSJ article. Preach it! http://fb.me/CnxI0XGW " oh, YES #YASaves! (To find the originals, go to the #YAsaves hashtag on Twitter).